There will be a shortage of 1.8 million information security workers by 2022, according to a study by the Center for Cyber Safety and Education. A similar study conducted by Cisco Advisory Services in 2016 reported that approximately one million cyber security job openings went unfilled around the world, suggesting that the prediction for 2022 will likely be realized. Raytheon undertook a study in 2016 to better understand the level of interest in cyber security careers, which sheds some positive light on the future of the cyber security industry. The study, which involved over 3,500 adults between the ages of 18 and 26, revealed several interesting and hopeful insights that might be considered by students exploring future careers in the field. Young adults strive to work for organizations that share their same goals and beliefs. Fortunately, cyber security impacts nearly every aspect of our economy and society, meaning that career opportunities exist in a variety of organizations that may attract young adults. Young adults showed great interest in high-paying careers that use problem-solving, analytical thinking and communication skills. Given that all of these skills are required in cyber security careers, there is potential that this field will appeal to a broad range of future employees. Women have had less exposure to cyber careers than their male equivalents. Moreover, more young women (38 per cent) are more likely than young men (25 per cent) to believe that no cyber security programs or activities are available to them. Yet, more young adults than ever are saying they would consider a cyber security career. Thirty-seven per cent of the respondents said they were now more likely to consider a cyber security career than they were one year earlier. These are positive indicators that cyber security will attract more students and employees moving forward, to help protect our information and economy against the ongoing proliferation of cyber threats. 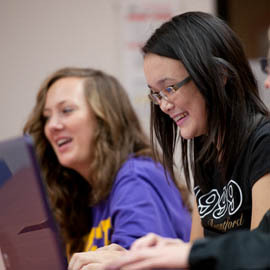 Laurier offers courses and programs that could help prepare you for a career in cyber security, like public safety, computer science, psychology, and business technology management. Read the full Raytheon report for more information about the talent gap in cyber security. Cyber Security Awareness Month is an initiative that began in the United States under the direction of the U.S. Department of Homeland Security. It is observed every October and offers an opportunity to reflect on the importance of online safety. Each year there are weekly themes that address some of the top issues in cyber security, and Laurier's ICT department participates by sharing the most relevant information with our faculty, staff, and students. Stay tuned for weekly posts throughout the month of October containing important tips on how you can protect yourself, your information and Laurier – online.